Posted on October 20, 2014 This might be outdated! Here is a quick snippet that I wanted to do for a long time. The aim is to allow you to create custom URLs to access products page with a specific tab active. 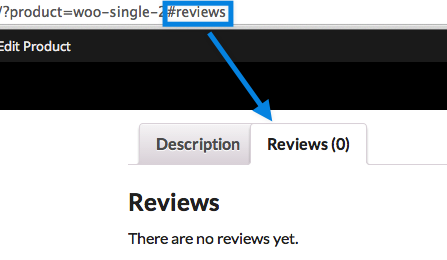 By default, when you access a product page, the “description tab” is active by default, but with this snippet you can open the reviews tab (for example) directly from the URL. Useful isn’t it? because of which it gives 500 error, when I straight away include the above code in functions.php file. Anyway, is it possible to overcome this error? Checked debug.log – no error messages. Tried on dev site also with different theme. This is great, any Idea how we can do this with a button on the single product page to open a specifiy tab? We mentioned something, how can we set the focus to the specific tab? Remi would this be easily fixed by adding an ‘id’ to each tab instead of a ‘class’? Maybe this is something Woocommerce could add. not working for me. no errors though. anyone have any luck w/a recent version of WordPress+WooCommerce? That was perfect, but I had to do some changes to make it work with the latest WC version. I’m now able to link directly to a tab from another page. But I’m unable to link from one tab of a product description to another tab. For example, I have two Tabs, “Updates” and “Details”. In the text of the “Updates” tab, I’d like to place a link so that when the user clicks on it, he jumps to the “Details” tab. How do I accomplish that?